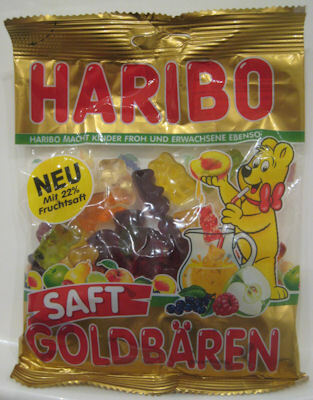 Compared to the traditional gummi bear, Hariboâ€™s Saft Goldbaeren stand out in a candy crowd. The texture, the flavors, the size, etc. all contribute to making this sweet treat a definite candy “must have.” And, as mentioned before, these candies provide a bit of nourishment: 22% fruit juice in every bag â€“ you canâ€™t go wrong. An unusually nice benefit for us sugar fiends. Thumbs up. Also of note: Except for the word â€˜SAFTâ€™ at the bottom of the bag, the packaging for Saft Goldbaeren and Hariboâ€™s traditional Goldbaeren is the same. Be discerning, or you might miss out on these tasty treats! Hi Gigi, do these contain Gelatin? I think this is the best candy review I’ve ever read. Thanks for the review! Small nit: Schwarze Johannisbeere is “blackcurrant” – blackberries would be “Brombeeren”. *sigh* Four years of German and I didn’t pick that up!